We have two reviews to end the month of September here at SuperPhillip Central. Both are Nintendo 3DS releases, so let's kick things off with the first. The game is in a series that has seen multiple games, but this one is the first to reach the West. 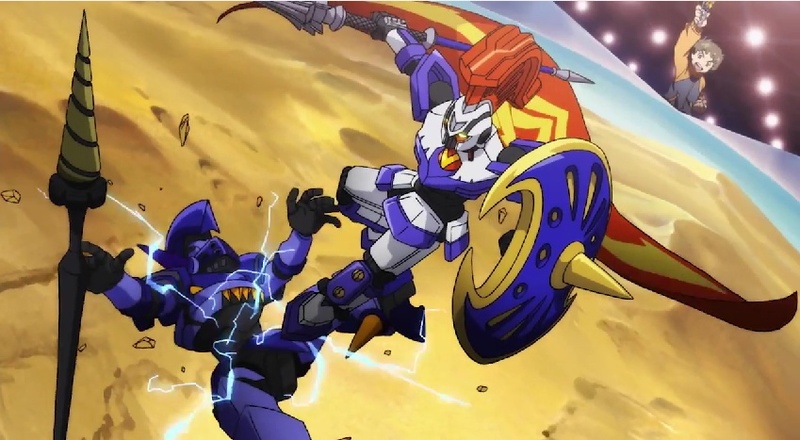 It's LBX: Little Battlers eXperience. Based off the anime that currently airs on the Nicktoons channel here in the United States, LBX, standing for Little Battlers Experience, features small toy robots with huge power behind them. 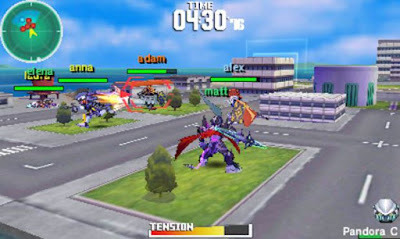 Battles take place in the safety of special fortified cardboard box arenas where up to six robotic battlers can combat one another either in teams or in a battle royale setting. 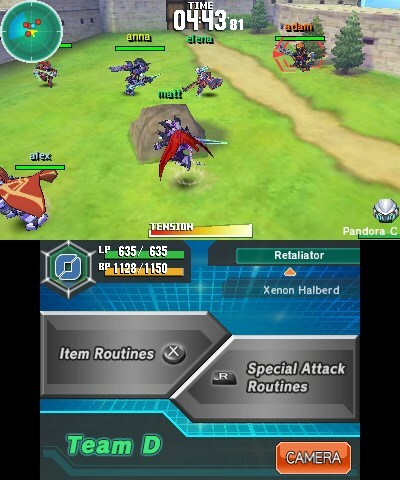 While Nintendo and Level-5 have come together to localize LBX: Little Battlers Experience for the Nintendo 3DS in the West, there have actually been a myriad of titles based off the property that first released on Sony’s PlayStation Portable before moving onto the Nintendo 3DS. Now, for the first time, us lucky Westerners get the opportunity to see what all the fuss behind this miniaturized mech combat series is all about. 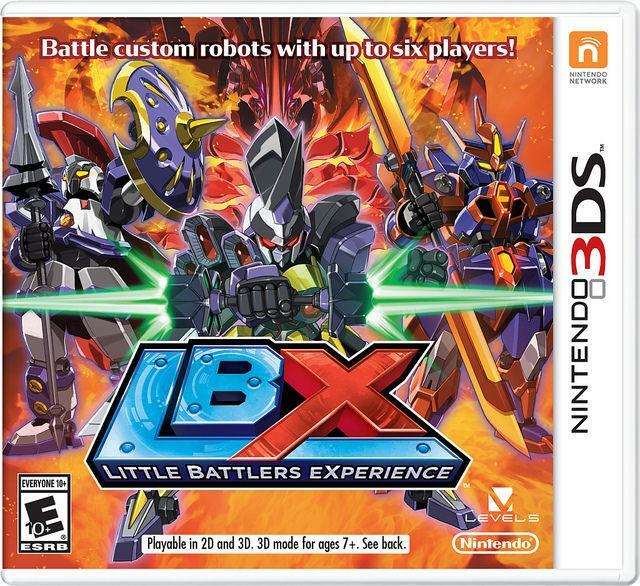 Does LBX: Little Battlers eXperience make for a good first impression to the series for the West? LBX follows the story of Van Yamano, a middle school student who is unlucky in the way that all of his friends battle and enjoy LBX robots, miniature figures with awesome power, and his mother currently does not let him do the same. It seems this will continue to be the status quo for young Van until a mysterious woman gives him a special LBX model that she says could help save the world. Now, not only does Van have an LBX to call his own, but he has a shifty organization looking to retrieve his LBX through any means necessary. The anime cutscenes look absolutely glorious. The story of LBX features well-done dialogue that while sometimes rote anime stuff, does occasionally separate itself from clichés. Some of the dialogue is read aloud, while other times most of it is needed to be read. Special anime cutscenes play during more important scenes of the game. The story itself has plenty of twists to keep players engaged throughout its 10 or so episodes, loosely following the cartoon, so if you’ve watched the show, you will somewhat familiarity with what happens in the game. Unfortunately, this leads to one of the first problems I need to address with LBX. On many occasions, you’ll find that you are unable to skip certain scenes of dialogue in the game. There was one point in a special tournament within the game that I kept failing. This meant I had to not only restart from an earlier point in the tournament, but to add insult to injury, I had to wait basically four minutes to get back to the point I was at, sitting through dialogue and flashy sequences with no guarantee that I would succeed my next “at-battle”. Nothing but anger and rage consumed my impatient soul as the game taunted me with no ability to skip a scene I must have watched at least five times after four separate failures at the tournament battle in question. Furthermore, a lot of LBX’s play time will consist of you running from place to place in the real world, which can sometimes be very tedious, divided up between areas of the town, whether it be the residential district, commercial district, Tiny Orbit HQ, the riverfront, and so forth. This is particularly noticeable if you do the optional quests that can have you involved in mighty fetch quests with the bonus of having some nice rewards such as LBX parts, items, and money. 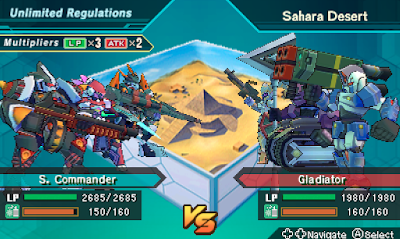 As stated in the introduction, battles in the world of LBX take place in arenas set inside fortified cardboard. The thought behind this is that before the invention of this special type of battlefield, LBX battles were much more dangerous, leading to a ban on the usage of them until fortified cardboard came along. This made it so battles have all the safety both LBX users and everyday citizens who might have been caught in the crossfire previously can appreciate. Ready for battle? Then let's get it on! Battles can have a wide set of rules. 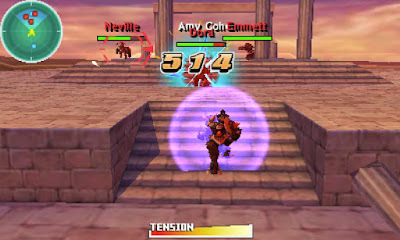 Some are one-on-one affairs while others are team battles with Van and his friend(s) taking on two or three rival opponents. Sometimes the goal is to simply eliminate the other LBX before they do the same to you, while other times you’ll have to knock them out three times. The "D" in "Team D" stands for Destroyers! With team battles, you basically have to micromanage, which if the partner AI were smarter, you wouldn’t have to do. This means healing your teammates with your own items, and hoping to the LBX gods that you aren’t once again put into a situation where it’s 1-on-3 because your worthless teammates’ LBX robots are already eliminated. 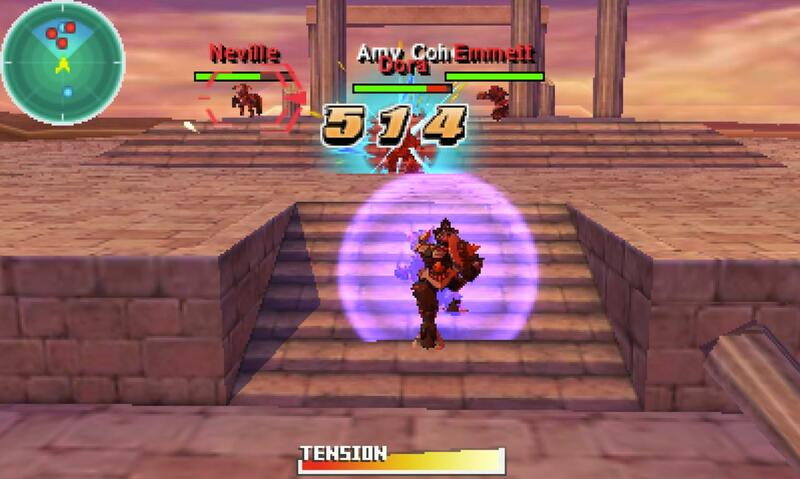 Typical battles give you various options to utilize: a simple attack button, a jump, a block, a dash, an item button, and a special attack button. 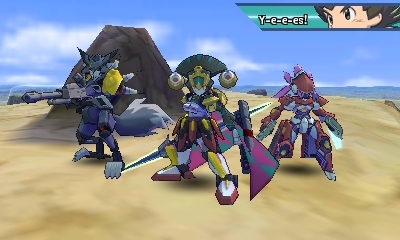 Using these in conjunction in one another offers plenty of offensive and defensive possibilities in each LBX battle you participate in, whether as part of the story or through talking with an NPC in one of the game’s numerous hubs. from plains and forests to glaciers and ancient temples. The life bar of each LBX is affected by what equipment (i.e. parts) is tied to it. In addition, there are other considerations to make note of in battle, such as the tension gauge. This gauge will quickly empty after successive attacks. Once it reaches zero, your attacks do little damage, so you have to back away and let it replenish itself which takes a few seconds. This is to make it so you can’t just mash your way through battles to win them. It takes some grace to win LBX battles! This goes into when an LBX falls on its back or front in battle. There is a nice invincibility period for LBX battlers that stand back up so they aren’t involved in an unfair and endless combo attack. The customization options for LBX fighters are pretty much limitless. You can mix and match parts of models for the head, body, left arm, right arm, left leg, and right leg. Depending on the parts chosen, your robot will move faster if it has light parts or move more slowly if it has parts that weigh it down. It’s an important consideration to make outside of just designing an LBX that looks awesome. You can also opt to just use a basic model set if customization of LBX does not fully appeal to you. Any set of LBX that you come up with can be saved in one of 30 slots, so you always have a loadout perfect for the battle ahead. There are a handful of weapon types that LBX can use. For instance, my favorite happens to be a lance or spear that has a good reach that can attack foes a little further away than those that use a sword. However, the latter is great because it can attack more quickly. You can even equip two swords at once for more attack opportunities, but the catch is that you can’t equip a shield to block enemy advances. In addition to close-range weapons, you have guns that can fire bursts at faraway foes, as well as sniper rifles that deal heavy damage from afar, but take precision aiming and some time to reload. Grinding for levels is an optional and by no means mandatory task in LBX, which is great as it bucks the trend of typical RPGs. Just because you’re a lower level than your opponent, does not mean that you’re necessarily going to lose or be at a disadvantage. It more boils down to your tactical fortitude and how you operate your controlled LBX. LBX offers multiplayer, but it sadly and confusingly only offers local play for up to six players. Finding six players with the game much less another person can be tough in this day and age, so the lack of online multiplayer is a severe oversight. Online play is very ni-- wait. No, no, no. It's totally missing! Not very nice at all! For those who like the idea of battling heavily customizable robots with a large layer of depth in its combat mechanics are sure to love LBX. It does have its small issues that gradually build up to be big problems, such as being forced to relive certain scenes again and again if you continuously fail the battles after them. 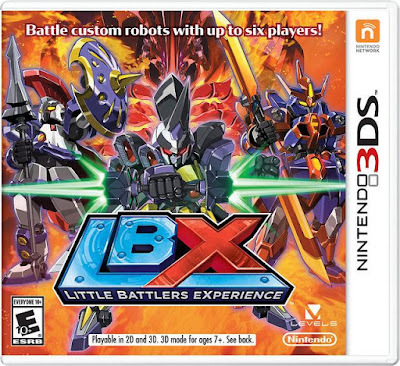 However, overall, LBX: Little Battlers eXperience is a game that both children and adults can enjoy. It’s great for children for the joy of battling toy robots, and it’s great for adults for all of the customization options available to them.